He's not the new Kevin Pietersen, but Jonathan Trott had good reason to feel like his fellow South African-raised, England batsman. Pietersen, who was a guest in the dressing room, has long been responsible for carrying his adopted home and Trott was forced into a similar role in an exacting debut innings. This Ashes decider is a contest where confident players are necessary and Trott is not short of self-belief. While most of his team-mates fell to feeble wafts, Trott had to be removed by the stunning reflex action of Simon Katich. Pietersen is known for his freaky dismissals and Trott fell to one in his maiden innings. Katich's brilliance deserved to be rewarded - he collected a firm clip at short leg and launched a direct hit before the batsmen's follow-through had ended - but it was a shame for Trott that it finished that way. Before his innings Trott nibbled at his nails in the change room but appeared calm and ready when it was his turn to walk down the steps. While he waited for 12 deliveries before scoring his first Test runs, he wasn't scared. Of course there were nerves - and a run-out chance for Katich - but he was comfortable enough to stride out to his first ball and offer a calm defence. He needed to be. Entering with England at 176 for 3, he was soon trying desperately to prevent any more leaking of unnecessary dismissals. After Ian Bell, Matt Prior and Andrew Flintoff went after tea the team had given up their advantage and were wobbling on a day supposed to be made for batting. Trott, whose best shot came with a cover-driven four off Stuart Clark, didn't stay for long enough, but attributing any blame to him for the dismissal is unfair. Apart from hitting it half a metre wider, nothing could have stopped the brief magic from Katich. He left disappointed with 41 but given his team's situation it was a valuable display. 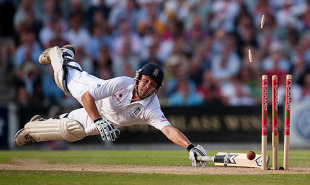 "Trotty looked like he was playing for Warwickshire," Bell said. "He's been in very good form, his feet were going well, he looked confident, and he didn't look out of place at all. He played very well and it's a good start for him. Hopefully he can take that confidence and kick on." Soon after his dismissal Trott was back by a dressing-room window shadow batting in preparation for the second innings, when he should be hard to dislodge again. While Trott was starting out, Flintoff is winding down. Flintoff was relaxed in the way players who have appeared in 79 Tests should be, but he was unable to put on the performance craved by those camped in the stands and near the windows of the nearby apartments. The trumpeter was blowing Livin' on a Prayer after Flintoff's not uncharacteristic dismissal, a hard drive outside off which ended in a loud nick to the wicketkeeper. It was a wasteful end to such an occasion, but those sorts of moments have made Flintoff as well as his fearsome exploits with bat and ball.